Santa’s going to be coming down the chimney soon — at Chimney Rock Park, a beautiful state park just 30 minutes south of the Inn on Mill Creek. 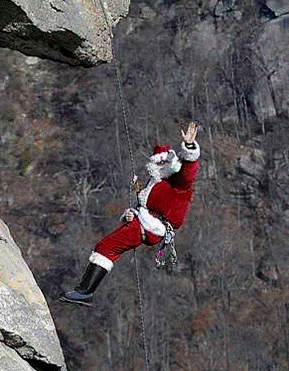 Before Santa makes his way down the chimneys at the houses of all the good boys and girls around the world, he’ll be doing a dry run by rappelling down the Chimney Rock, a 315-foot monolith. You’ll have two opportunities to see Santa at the Chimney: Saturday, December 4 and Saturday, December 11, from 11am to 2pm. Please note, if you visit Chimney Rock Park from December 1 through the winter season, you’ll see improvements being made, including replacement of the Outcroppings Trail, which leads down to ground level from the Chimney Rock. This means that the Sky Lounge, the elevator, the Outcroppings Trail, the Moonshiner’s Cave, the Birdhouse and the Skyline Trail will all be closed, and visitors (other than Santa) will not have access to the Chimney. However, several areas of the Park will be open, weather permitting, including the Hickory Nut Falls Trail, the Four Seasons Trail, the Meadows and the Great Woodland Adventure. This entry was posted in Uncategorized and tagged outdoors, Winter by Inn on Mill Creek. Bookmark the permalink.